Durbs (as it is fondly called by the locals) has something to offer everyone. If your ideal holiday is lying on the beach, then pick your spot of sand on any of the 6kms of beaches along the Golden Mile. If golf is your game, book a round at the world renowned golf course of the Durban Country Club. The city is sports crazy, and hosts various international contests, including test cricket at Sahara Kingsmead Stadium and Super 14 rugby matches at The ABSA Stadium. Don’t forget to shop! Gateway Theatre of Shopping is located just outside Umhlanga. The mall has a wide variety of shops, restaurants, theatres and an iMax cinema. It should keep you entertained for hours. 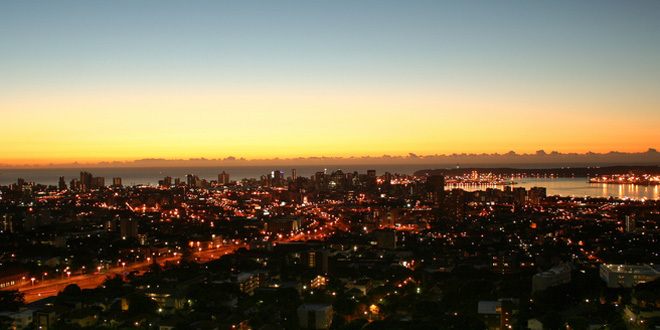 Durban is an ideal base from which to explore the game reserves and the Drakensberg Mountains. Both destinations are only a few hours drive away. Hluhluwe Game Reserve is a relatively short 3 hour drive up the North Coast. Established in 1895, and set in the heartland of Zululand, it is the oldest reserve in Africa and boasts the ‘big five’. Or you can visit the Ukhahlamba Drakensberg Park. Set in the majestic mountain range, this World Heritage Site is also one of South Africa’s prime eco-tourist destinations. Take your hiking boots with you and enjoy the spectacular scenery as you walk the well laid out paths from the all the major camps.